Normally, I think and process the world around me in English simply because it comes more naturally and proficiently for me. The one exception is food. When it comes to food, my brain switches back and forth between English and Cantonese. There are some cultures in the world that are food centric. Chinese is definitely one of them. The volume of adjectives and phrases associated with food in the Cantonese language is enormous in comparison to English. With English I have to ramble on in an effort to describe exactly what I experienced and often only to come away with a near perfect description. 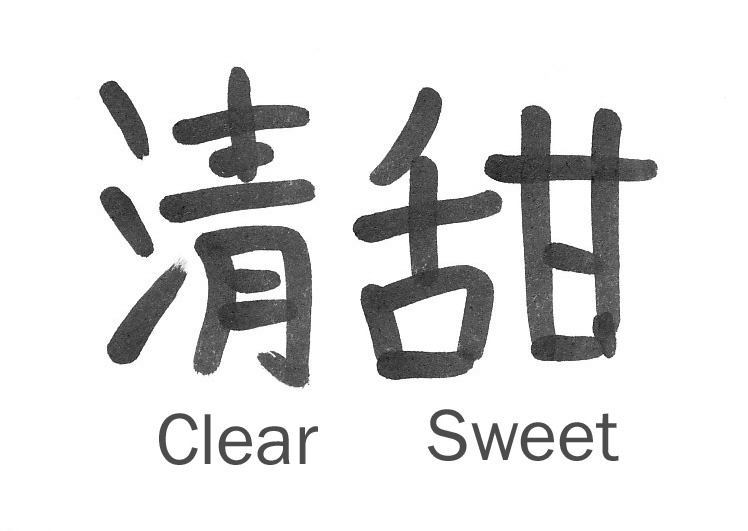 In comparison, I find Cantonese much more succinct in terms of describing aromas, tastes and textures of food. I found myself in this situation with my write up for the Tamago Ramen I had at Marutama Ramen. I was grasping at how to describe the broth Marutama used in its ramen when the perfect Cantonese adjective popped into my head. Now here’s my best attempt to describe the taste of the soup in English. The broth reminded me of the chicken soup my mom would make when I was sick as a kid. She would take stewing chicken, just a few slices of ginger and some dried red dates and simmer a soup for 4 -5 hours. The broth had an intense chicken flavour but that was it. It’s not complex or robust like the pork soups serve by other ramen shops in the city. The chicken flavour bursts onto your palate with the first sip and then disappears leaving no aftertaste much like a firework brilliantly exploding in the night sky and as quickly fading into black. See the difference a language can make, five sentences and about 103 words versus 2 Chinese characters (well maybe 3 Chinese Characters as I would add the character for “very”). With such as simple yet satisfying broth, the noodles that went with it were very fine, probably the thinnest I come across in Vancouver. They worked very well with the soup and I have a feeling that coarser noodles might have overwhelmed the soup. 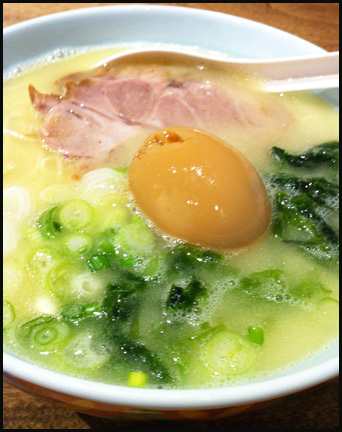 Much has been made about the marinated egg that is served at Marutama. It is definitely a great marinated egg. Cooked perfect with a medium yolk, what made the egg stand out was that even the yolk had a taste of the marinade. In addition the white around the yolk was not hard boiled but was just barley cooked. Another component of the ramen that was distinct was the use of Aosa seaweed. Its aroma was the first thing I noticed when the bowl of noodle was placed in front of me. It definitely stimulated my appetite with its fresh ocean smell. 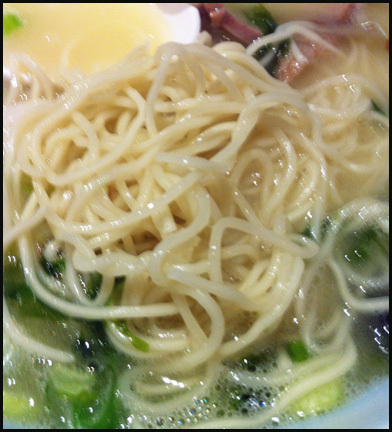 The Aosa seaweed complemented the broth and noodles well. The waitress offered me perfectly fried sliced garlic to go with the ramen. Thankfully I only put a few in, as the strong garlic taste dominated the few bites they were in, masking all the flavours. I actually cannot imagine the garlic chips overwhelming a complex pork broth, which speaks to how different and simpler Marutama’s fare is. From the tasty but uncomplicated chicken soup, fine noodles, well prepared egg, Aosa seaweed and a slice of sweet pork, the Tamago ramen is a delicious but much more delicate ramen bowl in comparison to the pork based soups offered by their competitors in Vancouver. From another perspective, Marutama serves a phenomenal bowl of Japanese style chicken noodle soup. Since I can’t always get my moms slow simmered “clear sweet” chicken soups, I can actually see myself wanting their tamago ramen if I felt a cold coming on or if I was just recovering from the flu. 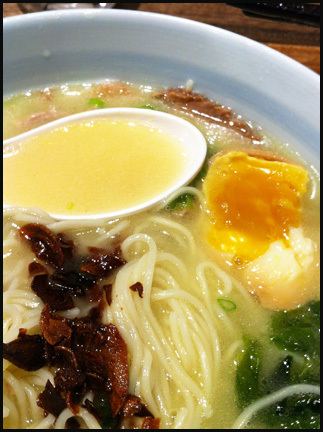 The tamago ramen is a well-executed, quality bowl of noodles. In my books, Marutama has joined the lead pack of Ramen slingers in this city.